Talbot is a rural town 15 km south of Maryborough and 130 km north-west of Melbourne. Gold fields were opened up in the Talbot district in 1852 centring on Amherst about 5 km northwards. In 1859 a group of prospectors found the Scandinavian Lead near Back Creek which attracted hundreds of diggers. Prior to then a township had been surveyed on the Back Creek flat, but the gold lead about 500 metres to the east caused a second settlement to form, near the present site of the Talbot railway station. Scandinavian Crescent superseded Argyle Street as the main street. Known as the Back Creek diggings for a while, the name Talbot was given in 1861 at the suggestion of the Victorian Governor, possibly as a compliment to the Talbots of Malahide Castle, Dublin or the Talbots of Shrewsbury, England. 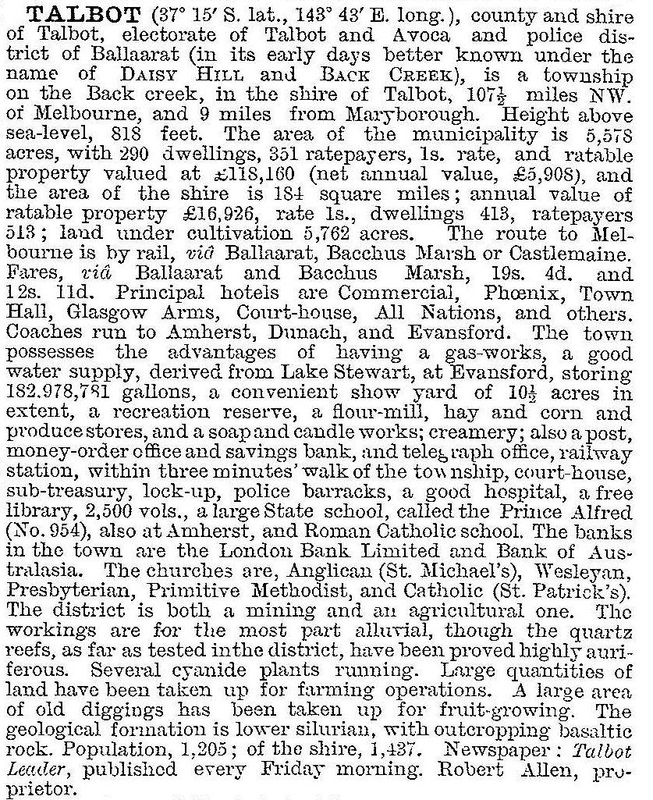 Talbot was included in Amherst borough which was renamed Talbot borough on 19 April 1875. In 1865 Bailliere’s Victorian gazetteer recorded Talbot as having two breweries, a soap and candle works, a hospital, a mechanics’ institute, a county and other courts, 19 hotels, private schools and a National school (1858). There were also a gas works (1859), Wesleyan and Presbyterian churches (1863-64) and a reservoir (1858). As Talbot approached its peak census population (1881), several other churches and civic buildings were constructed. The Talbot railway station was built for the Ballarat to Maryborough line in 1875. The further reduction in population resulted in many private and commercial buildings being removed, but government and church buildings have survived remarkably intact, although in need of repair. They constitute a remarkably complete architectural record for a medium size gold town. Talbot’s location away from the main highway has contributed to the avoidance of redevelopment of the building stock. The Catholic church, a significant Gothic Revival building (1869), was sold in 1977 and remains extant. On 25 September 1915, Talbot borough was united with Talbot shire, which subsequently became Talbot and Clunes shire. In 1933, when Talbot’s population was about 600 people, a new mine was opened at nearby Caralulup, but it closed in 1940. Talbot and Clunes obtained bicentennial funds for a heritage study in 1988, leading to a comprehensive inventory of Talbot’s many historical sites and buildings. A museum is in the Primitive Methodist church (1870) in Camp Street. Talbot is set in an agricultural hinterland, with patches of State forest and numerous old gold workings around it. Seven roads radiate from the town, but none is more than a main local road. There are public and memorial parks, a golf course, a sports ground, a swimming pool, a museum and several public halls. The Talbot walking tour map identifies over 40 sites and buildings. Many of the buildings can be viewed at Talbot’s monthly farmers’ market. The town hall underwent restoration works in 2009. The town has yet to be sewered. Talbot primary school (formerly the Prince Alfred) had 59 pupils in 2014.